Expedia.co.uk is available 24 hours on 020 3564 4853 or from outside the UK on +44 20 3564 4853. Calls are charged at your local rate. However costs may vary depending on your service provider and from mobile phones. Expedia.co.uk is available 24 hours on 020 3564 5165 or from outside the UK on +44 20 3564 5165. Calls are charged at your local rate. However costs may vary depending on your service provider and from mobile phones. Located in Manchester City Centre, this spa hotel is within a 10-minute walk of National Football Museum, Manchester Arena, and Printworks. Manchester Cathedral and Deansgate are also within 15 minutes. Victoria Station is 8 minutes by foot and Manchester Victoria Station is 8 minutes. This smoke-free hotel features a full-service spa, a restaurant and an indoor pool. WiFi in public areas is free. Additionally, a fitness centre, a bar/lounge and a sauna are on-site. All 252 rooms offer free WiFi, 24-hour room service and LCD TVs with digital channels. Hairdryers, safes and ironing boards are among the other amenities that guests will find. 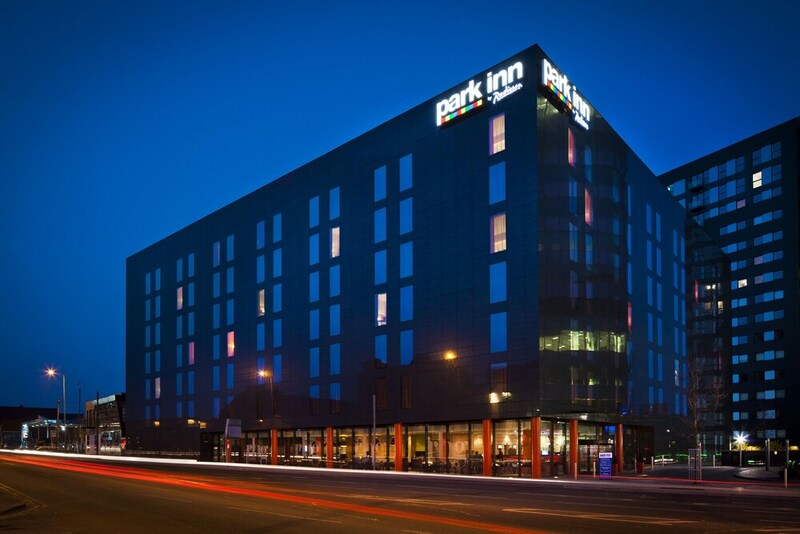 In addition to a full-service spa, Park Inn by Radisson Manchester City Centre features an indoor pool and a sauna. The hotel offers a restaurant. A bar/lounge is on site where guests can unwind with a drink. Public areas are equipped with complimentary wireless Internet access. A business centre is on-site at this 4-star property. This eco-friendly hotel also offers a fitness centre, a rooftop terrace and spa services. Park Inn by Radisson Manchester City Centre is a smoke-free property. Buffet breakfasts are available for a surcharge and are served each morning between 6:30 AM and 10:30 AM. RBG Bar and Grill – This restaurant serves breakfast, lunch and dinner. Guests can enjoy drinks at the bar. Start your morning with a buffet breakfast, available each day from 6:30 AM to 10:30 AM for a surcharge. You can order a meal from 24-hour room service. Recreational amenities at the hotel include an indoor pool, a sauna and a fitness centre. Nu Spa has 2 treatment rooms. Services include hot stone massages, Swedish massages, facials and body treatments. The spa is equipped with a sauna and a steam room. No on-site parking is available. Reservations are required for massage services and spa treatments. Reservations can be made by contacting the hotel prior to arrival, using the contact information on the booking confirmation. The property has connecting/adjoining rooms, which are subject to availability and can be requested by contacting the property using the number on the booking confirmation. This property participates in Green Tourism Programme, a programme that measures the property's impact on one or more of the following: The Environment, the community, the cultural heritage and the local economy.